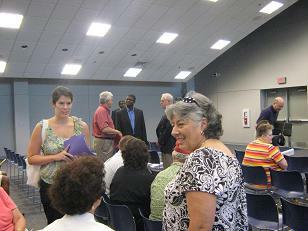 The Healthcare Forum with Rep. Jim Clyburn on Saturday was attended by about 150 people. Thanks to all of you who attended the event and passed out fliers. 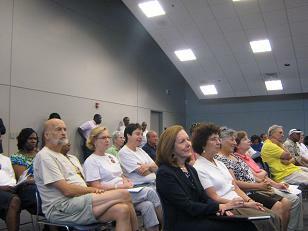 Over 150 people turned out Saturday, July 13th to hear Congressman James Clyburn, the House Majority Whip, preside over a two-hour forum on health care reform at Charleston's International Longshoremen's Association Hall. 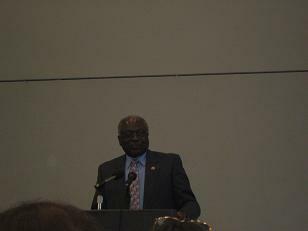 Clyburn opened and closed the session with fact-filled descriptions of the battle in Congress to agree on a health care reform bill. 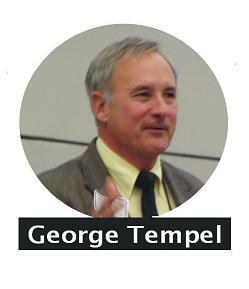 He predicted that a bill with a public option will pass the House, but not the Senate. He hopes a bill with a public option will emerge from the conference process, and can then be passed in the Senate using reconciliation rules, which require only 51 votes to pass. He has a personal interest in the way small businesses are treated in the bill. Defining a small business has been an issue in Washington. It has just been resolved in favor of the number of employees, rather than the amount of income. Small businesses with less than 10 employees (going up to 25 in later years) would be exempt from requirements to provide health insurance, and would probably get a tax credit if they chose to do so anyway. He did not discuss how employees of exempt businesses would get insured. 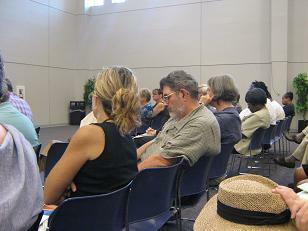 He discussed single payer (government) insurance. A bill in Congress which favors single payer has gotten 100 signatures, but Clyburn said it has "topped out" at that number, and needs 218 to pass. 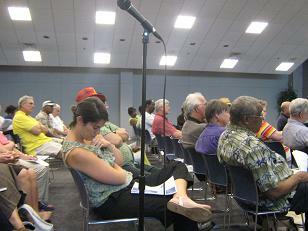 About 15 people who had pre-registered to speak described their difficulties with health insurance. Several owned small businesses and could not afford insurance for themselves or their employees. 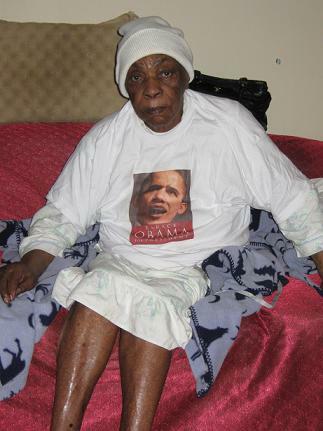 Several had had health crises and were treated as charity cases by local hospitals. About 10 people who had not pre-registered also spoke. 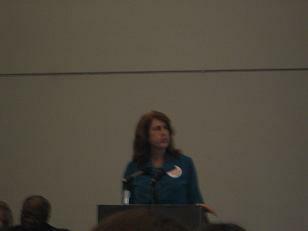 They were primarily advocates on issues such as single payer, and coverage for addition-related services and reproductive health services. 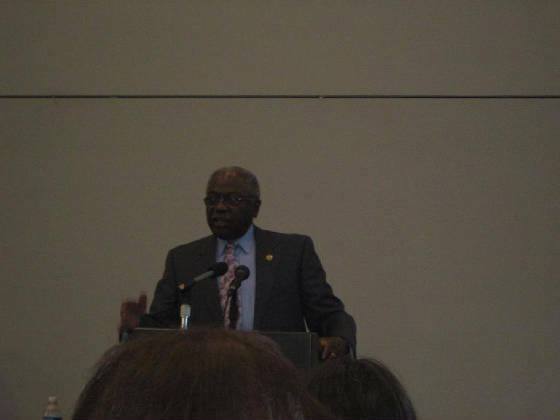 Clyburn told participants that the best way they could support health care reform is to write or e-mail their House and Senate representatives, even if they haven't supported health care reform. In Charleston, your House representative is either Clyburn or Cong. Henry Brown. In the Senate, we are represented by Sens. Lindsey Graham and Jim DeMint. 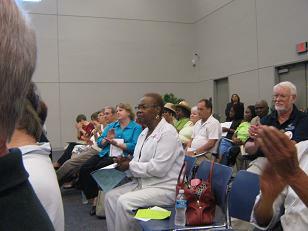 The forum was co-sponsored by Clyburn, South Carolina Fair Share, and SC Appleseed Legal Justice Center. 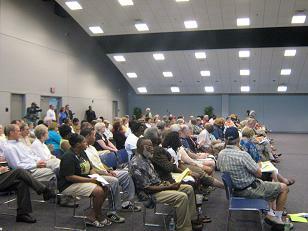 Similar forums were held in Columbia and Rock Hill. For more informtion: www.schealthcarevoices.org.